Do you remember how I like to take Dexcom breaks? I think that when I don’t, I start to ignore alarms, especially high alarms. Not wicked high alarms, but anything between 200-230 easily gets ignored when I start becoming complacent. When I take a break, I test more and act more. It keeps me healthy and accountable. However, I do not like to ski without the data. I found recently that when I’d be high, I was high for hours, especially overnight. The last time I was at Sunday River with my family, I woke in the morning with my Dexcom missing. My parents had moved it to the bathroom because it kept going off. I understand, however, how can it do it’s job if it’s not near me? This past weekend I told them to wake me up if it goes off and I don’t stop it. I was woken up a few times this weekend, and last night I set an alarm for the middle of the night. 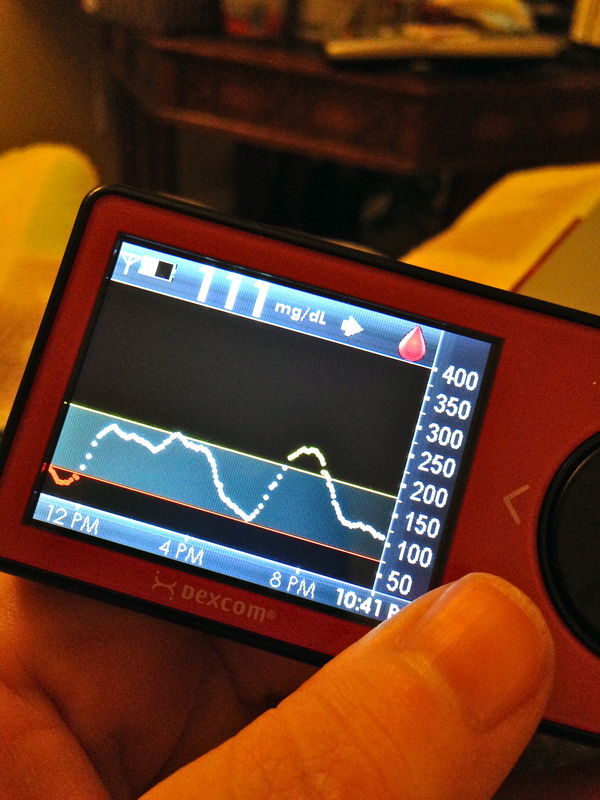 (How come my phone can wake me up, but not my Dexcom?!) I tested, bolused and woke up at a much more reasonable number than I have been. It may be a small victory, but it is still a victory. I hope that short highs become more common than the 10-12 hour highs that I was seeing even just yesterday. I love how it evens out into a beautiful plateau. Ahhhh. Refreshing. Excellent insight. Congrats on working this out. To the outside observer, this may be ho-hum. But to all of us living with diabetes, we know how much effort (on top of everything else going on) this takes. Every single victory counts. I’m the opposite of you – I tend to ignore my low alarms, especially overnight. I’m working on that too. Last night instead of muting it, I tested and ate two GlucoLift. Rah!! I’ve been not waking up to my Dexcom and had to do the Dexcom in a glass thing. Once I’d go high at night I’d stay high for a long time and that’s not good. Looks like you accomplished that!